The Silverado Community Association is putting on their Annual Garage Sale Parade 2018 on Saturday, August 11, 2018. JoAnne & Joseph Purcell with CIR Realty are excited to sponsor and volunteer to run the event this year. Both JoAnne & Joseph are proud residents of Silverado! All homes hosting a garage sale who register in the parade will be included on the map and materials distributed to shoppers. 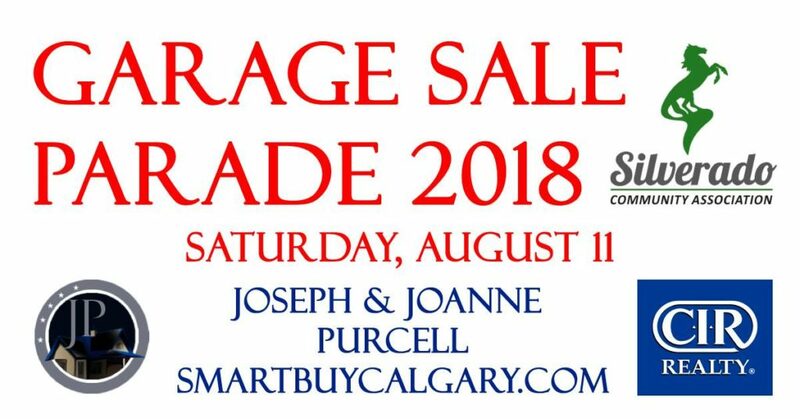 You can register to participate in the sale parade by submitting your contact information at http://www.smartbuycalgary.com/silverado-garage-sales.php. We will then get in touch with more information about the parade. If you have questions or prefer talking to someone, call Joseph at 403.612.5298.